It can thus be expected that there will be a higher prevalence of job stress among IT/ITES professionals indicating a need to study such workers and suggest interventions. The review of the literature suggests that there is an association between job related factors such as stress and strain at work with poor general health, musculoskeletal diseases and cardiovascular dysfunction. ,, There are several measures of job stress employed in quantitative and qualitative method based studies. The qualitative study methodologies studies are carried out in isolation and have not been used to prepare questionnaires for the quantitative studies in India. Furthermore, very little is known about combining both methods in a given study and ascertains validity while measuring job stress. The objective was to accurately measure the constructs of job stress and to check for the internal consistency while measuring among software professionals. This is important to explore as there is limited evidence on verifiable measures of job stress available from studies done in developing countries such as India. Hence, we compared contextual stressors developed from qualitative study with occupational stress index (OSI) among IT/ITES professionals in India. The current paper focuses on methods involved in implementation of the study and their validity. We employed mixed methods sampling strategy for selecting the IT/ITES professionals for the study. Specifically, the first phase of the study comprised of a qualitative study followed by a second phase of cross-sectional study among workers in the IT and ITES sector in Bengaluru. The "study population" was defined as all persons aged 50 years or under who began to work as IT/ITES professionals as of 1 st January 2010, at 21 sites involved in the IT and ITES sector in Bengaluru. , The objective of the qualitative study was to identify specific contextual risk factors (exposure to job stress related factors) for ill-health including hypertension and to understand their influence among IT/ITES professionals. This was followed by a cross-sectional study to determine the prevalence of the contextual occupational stressors (found from the qualitative study) and its influence on among IT professionals [Figure 1]. Details on methods followed in the qualitative study are described elsewhere. , In brief, the qualitative study was conducted between August 2010 and March 2012 in the city of Bengaluru. We conducted 32 in-depth interviews with IT/ITES workers, recruited with the assistance of supervisors and Human resources (HR) Managers in IT and ITES organizations. Participants were recruited from workers holding different job titles, team leaders and administrative staff of informal groups. Recruitment of volunteers was done through personal communication as well as with the help of HR managers. The qualitative study was anonymous. Components from the contextual stressors based on the results from the qualitative study. The effort to detect and exclude variables with multi-collinearity is reported here. First, we used dummy variables to exclude categories and variables that had the same meaning in analysis. Due caution was applied while excluding a variable that was computed from other variables in the equation (e.g., income was part of SES, hence it was not entered as a separate variable for the adjustment). We ensured that same or almost same variables were not entered twice (For e.g., height in cm and body mass index having height 2 was not entered simultaneously). After ensuring the above, we ran regression diagnostics to detect internal consistency and collinearity. The study was anonymous and no names or other personal identifying information were collected from the participants. Each participant was assigned a unique number that linked individual information of the participants for the purpose of the analyses. Quiet private rooms provided by IT/ITES companies were used for collection of information for both qualitative and quantitative phases. The study was reviewed and approved by the University of California, Los Angeles Institutional Review Board (IRB, #G09-12-002-01, IRB#10-001348) and the Ethics Committee of The Public Health Foundation of India (TRC-IEC 40/10). We invited 1369 IT/ITES professionals to participate in the study; the refusal rate was 4.7% (n = 64). Among the 1305 professionals who accepted the questionnaire for answering, 171 (13%) didn't return them. 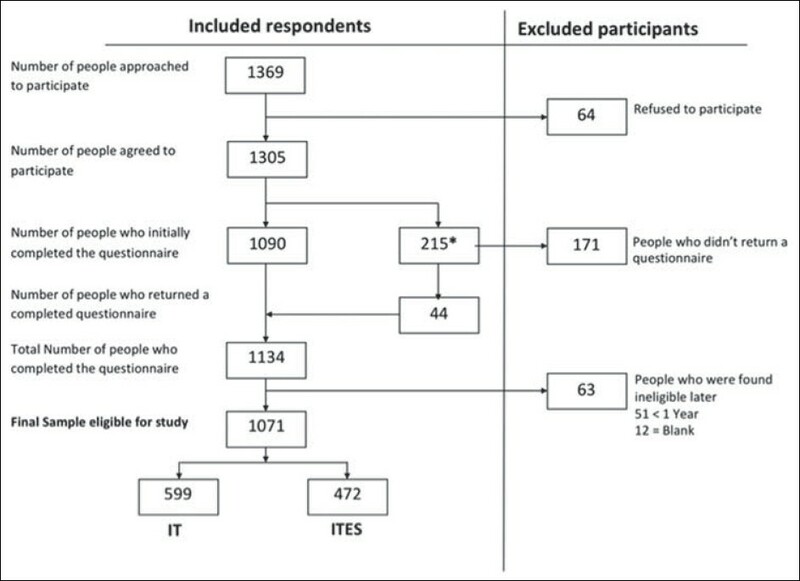 Among the people who returned the questionnaire (1134), we found 51 (4.6%) to be ineligible based on the inclusion criteria (duration < 1 year). There were 12 subjects with missing data on inclusion criteria who were included for analysis. By treating non-responders as refusals, the refusal rate is 22%. If we exclude non-responders, the refusal rate was 18%. Among the eligible subjects (1071), we conducted the analysis regarding job stress and hypertension that included 599 IT professionals and 472 ITES professionals [Figure 2]. [Table 2] provides description of continuous variables used in the study. We had two different types of stress domains. The first domain comprised of contextual stress factors. 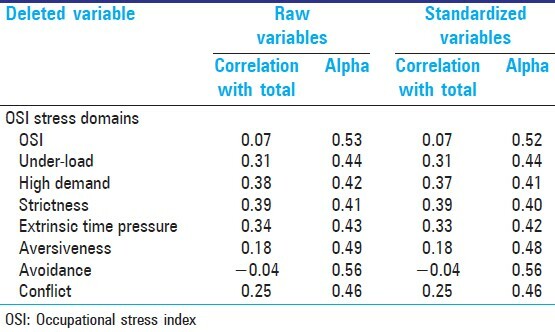 The results of internal consistency and correlation among the contextual stressors are provided in [Table 3]. The results of internal consistency and correlation among the contextual stressors are provided in [Table 4] and [Table 5]. Similar analysis has been performed on the sub domains of OSI and their results of collinearity. However, they are not relevant here as they are already subsumed within OSI. OSI is an additive model incorporating all the subdomains based on the results from theoretical models and results from cognitive psychology experiments. Hence, it would not be meaningful to split the sub domains and see their correlation amongst each other and further use this information to include in our models. Hence, whereas using OSI, it is "All or None" principle; either all the subdomains incorporated into one single OSI score is included in the model or OSI is not included at all. However, for the results are provided in [Table 2] to explore the nature of correlation amongst each domain and with overall OSI. 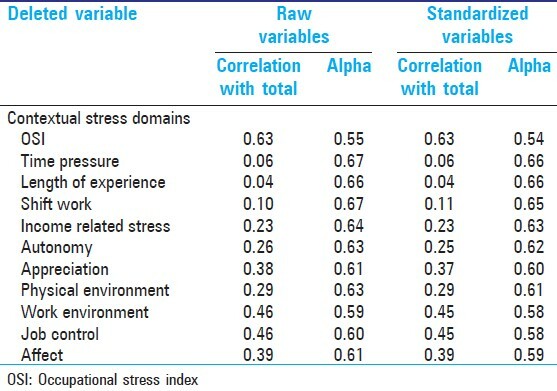 The results indicate that stress domains are poorly correlated with each other [Table 4] and [Table 7]. OSI doesn't correlate well with contextual stressors [Table 4] and [Table 6]. 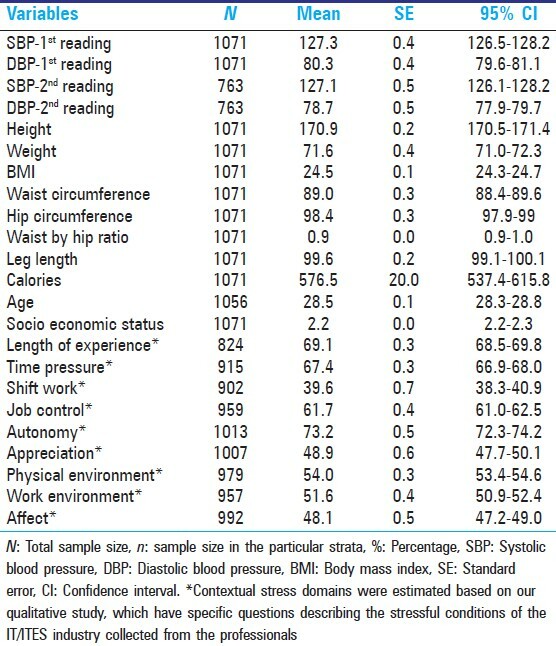 This is because OSI is a generic questionnaire designed for computer worker, while the contextual stressors are designed based on the results from qualitative study. India is on the verge of tacking a major epidemic of cardiovascular diseases among young population. ,,,,,,,,,,, Hence, it is very important to ascertain the possible risk factors affecting the young people in developing hypertension. In the absence of clear evidence from India, it is very important that locally contextual stressors are included in the study. We used both OSI and contextual stressor domains as part of the validation study to include the questionnaires for the Bengaluru IT workforce study. 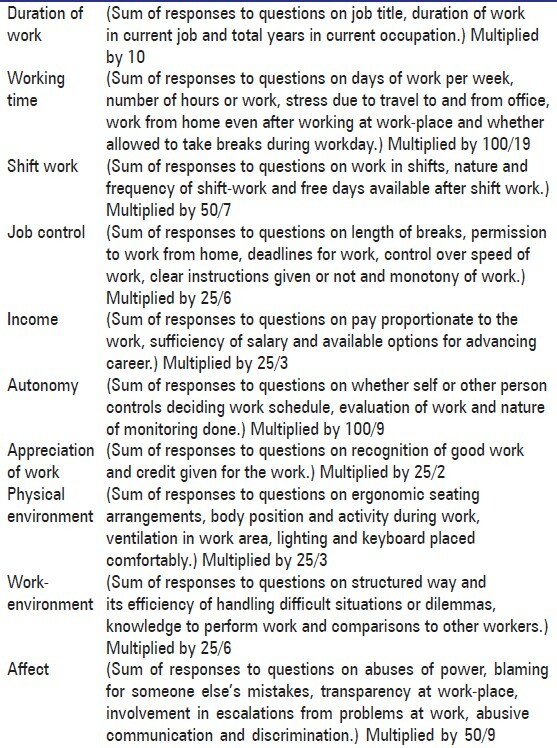 OSI is a questionnaire designed for computer worker mostly in different parts of the world, while the contextual stressors are designed based on the results from earlier qualitative study. The contextual stressors thus, reflect the predominant local stress conditions, which are important according to the local contexts of work environment. Hence, it is important to explore the association of each of the contextual stress domain with outcome separately. Based on these results, it is also justified to include all the contextual stress domains if one intends to do multivariate analysis, as the results would give most important factors among them. However exploring individual stress domains is important for the reasons of designing interventions to reduce, the need be, based on the results of associations. In the pursuit of objective questionnaires of job stress, there has been considerable and inconclusive debate over the use of job-specific against generic measurements. It is also difficult to develop questionnaires based on one theoretical model, as researchers would be running the risk of leaving out best features of other models. The difficulty to select questionnaires enhances complexity in the absence of evidence on details on job components, work environment, type of supervision and cultural contexts. Our methodology allowed for using OSI whilst we also added another short questionnaire that sought information on contextual stressor domains as well. This was necessitated as results from our study indicated that OSI doesn't correlate well with contextual stressors. India is undergoing epidemiological transition. It is important to identify the environmental risk factors for developing hypertension in young professionals. There are several studies in India estimating the high prevalence of hypertension in different parts of the country. However, there is hardly any study done to estimate the association of job stress of hypertension. Hence, it is important to perform validation study to show how best the information on job stressors can be captured and maximize the utility of available indexes for assessing job stress. Our study had some limitations. First, it had to be noted that not all companies were located in the identified IT parks. We conducted the study in confined areas of the IT parks, wherein several companies of IT sector were located. It is possible that there might be other companies that are outside the park and hence could not be included in the sampling frame of our study. The core-functions of IT companies were very specifically defined and it is very hard to imagine that companies would differ greatly within Bengaluru merely because they were outside the IT park from those who were inside. Most of the big IT Companies had their office in the vicinity of IT Park. We argue that stress levels in small IT companies might be more compared with the larger companies. Hence, by limiting the chances of smaller IT companies to get included because they were located outside, if any bias got introduced at all that is expected to result in under-estimation of job stress and hypertension. Second, OSI doesn't discriminate between missing values and no values. There was a possibility that information was misclassified. We studied prevalent cases of hypertension and hence might under-estimate the effects of job stress if it truly caused hypertension but also caused subjects to leave the job. The same bias could occur if instead of terminating the employment, those who were affected by job stress had got transferred into occupation that did not have much stress. Hence, workers moving out of IT/ITES workforce could explain the negative or no association. Several studies have included generic and occupation specific questionnaires reasonably standardized and validated in developed countries to estimate job stress. However, there seems to be little consensus on which one of these indices can be referred to as the "gold standard," which can be used universally. Further, researchers in low and middle-income countries (LMICs) will also have to consider limitation of extending the constructs and questions derived from developed countries. In such scenarios, use of mixed methods can be very useful. Use of qualitative studies can identify contextually meaningful local stressors, which can strengthen the existing questionnaires. Performing validation of the questions generated by qualitative studies will guide the formulation of more efficient questionnaires. In LMICs, where no existing questionnaires for assessing job stress are available, we consider that mixed methods will be a valid option. Notwithstanding some of the important findings, like any other cross-sectional study, caution will have to be applied before conclusive inferences can be drawn before applying the stressors domain reported in this paper or finding their association with high blood pressure. We recommend supplementing occupation specific job stressor questionnaires with questions specific and local to the target groups being studied. Effort to obtain specific and contextually relevant data is especially useful to guide intervention research and for advocacy to bring in desired changes in local participants. We would like to thank Shanth Kumar for the help in data collection and all the participants of the study. 1. Reddy KS. India wakes up to the threat of cardiovascular diseases. J Am Coll Cardiol 2007;50:1370-2. 2. Kristensen TS. Cardiovascular diseases and the work environment. A critical review of the epidemiologic literature on nonchemical factors. Scand J Work Environ Health 1989;15:165-79. 3. Yusuf S, Reddy S, Ounpuu S, Anand S. Global burden of cardiovascular diseases: Part II: Variations in cardiovascular disease by specific ethnic groups and geographic regions and prevention strategies. Circulation 2001;104:2855-64. 4. Ezzati M, Lopez AD. Estimates of global mortality attributable to smoking in 2000. Lancet 2003;362:847-52. 6. Gupta R, Gupta VP, Sarna M, Bhatnagar S, Thanvi J, Sharma V, et al. Prevalence of coronary heart disease and risk factors in an urban Indian population: Jaipur Heart Watch-2. Indian Heart J 2002;54:59-66. 7. Padmavati S. Epidemiology of cardiovascular disease in India. I. Rheumatic heart disease. Circulation 1962;25:703-10. 8. Steyaert J, Gould N. Social work and the changing face of the digital divide. Br J Soc Work 2009;39:740-53. 9. Singh J. Price of Success. The Tribue, Spectrum. 2007. Available from: http://www.tribuneindia.com/2007/20071014/spectrum/main1.htm [2007 Oct 14]. 10. Belkic, Karen. "The Central Nervous System: Bridge Between the External Milieu and the Cardiovascular System-The Forebrain: Central Stress Mechanisms and CV Responses Occup Med 15: 107-116, 2000." Occupational Medicine-State of the Art Reviews 15.1 (2000): 107-116. 11. Belkiæ K, Schnall P, Landsbergis P, Baker D. The workplace and cardiovascular health: Conclusions and thoughts for a future agenda. Occup Med 2000;15:307-21. 12. Belkiæ, K., Saviæ, È., Theorell, T., Cizinsky S., Work stressors and cardiovascular risk assessment for clinical practice. Part I. Stockholm: National Institute for Psychosocial Factors and Health, Section for Stress Research; 1995. 13. Bøggild H, Knutsson A. Shift work, risk factors and cardiovascular disease. Scand J Work Environ Health 1999;25:85-99. 14. Harrington JM. Health effects of shift work and extended hours of work. Occup Environ Med 2001;58:68-72. 15. Inc. I. List of software companies in Karnataka, India. 2010. Available from: http://www.karnataka.com/industry/software/companies/ on 12 th Nov 2011. 17. Babu GR, Sathyanarayana TN, Kar SB, Detels R. A qualitative study about perceived occupational stressors and the health of professionals in information technology in Bengaluru, India. [In Press] The Qualitative report. 2013. 18. Babu GR. Prevalence of job stress, general health profile and hypertension among professionals in the information technology sector in Bengaluru, India. 2012. 19. Altman DG. Statistics in medical journals: Developments in the 1980s. Stat Med 1991;10:1897-913. 20. McCullagh, Peter. "Regression models for ordinal data." Journal of the royal statistical society. Series B (Methodological) (1980): 109-142. 21. Teddlie C, Yu F. Mixed methods sampling. J Mix Methods Res 2007;1:77-100. 24. Belkic K, Savic C. The occupational stress index - An approach derived from cognitive ergonomics applicable to clinical practice. Scand J Work Environ Health 2008;34:169. 25. Murphy LR. Job stress research at NIOSH: 1972-2002. 2002. 26. Belkic K. The occupational stress index: An approach derived from cognitive ergonomics and brain research for clinical practice: Cambridge International Science Publication; 2003. 27. Emdad R, Belkiæ K, Theorell T, Cizinsky S, Saviæ È, Olsson K. Work environment, neurophysiologic and psychophysiologic models among professional drivers with and without cardiovascular disease: Seeking an integrative neurocardiologic approach. Stress Med 1997;13:7-21. 28. Belkiæ K, Saviæ C, Djordjeviæ M, Ugljesiæ M, Mickoviæ L. Event-related potentials in professional city drivers: Heightened sensitivity to cognitively relevant visual signals. Physiol Behav 1992;52:423-7. 29. Belkic K. Occupational stress index: An introduction. Scan J Work Environ Health 2000;73-86. www.workhealth.org/index.html. 30. Hannerz H, Albertsen K, Nielsen ML, Tuchsen F, Burr H. Occupational factors and 5-year weight change among men in a danish national cohort. Health Psychol 2004;23:283-8. 31. Nediæ O, Belkiæ K, Filipoviæ D, Jociæ N. Work stressors among physicians with and without the acquired cardiovascular disorders: Assessment using the occupational stress index. Med Pregl 2008;61:226-34. 32. Schnall P, Belkiæ K, Pickering TG. Assessment of the cardiovascular system at the workplace. Occup Med 2000;15:189-212. 33. Nediæ O, Belkiæ K, Filipoviæ D, Jociæ N. Job stressors among female physicians: Relation to having a clinical diagnosis of hypertension. Int J Occup Environ Health 2010;16:330-40. 34. Ugljesiæ M, Belkiæ K, Boskoviæ D, Boskoviæ S, Iliæ M. Exercise testing of young, apparently healthy professional drivers. Scand J Work Environ Health 1996;22:211-5. 35. Belki K. Occupation-specific versus general self-report measures to assess psychosocial workplace exposures-dilemmas and potential solutions to bridge the gap. Work and Health. 2001(10):258-60. 36. Emdad R, Belkic K, Theorell T, Cizinsky S. What prevents professional drivers from following physicians′ cardiologic advice? Psychother Psychosom 1998;67:226-40. 37. Institute S. SAS software, Version [9.1] of the SAS System for [Windows]. Copyright© . SAS Institute Inc. Cary, NC, USA. 38. Cronbach LJ. Coefficient alpha and the internal structure of tests. Psychometrika 1951;16:297-334. 39. Beaglehole R, Bonita R, Horton R, Adams C, Alleyne G, Asaria P, et al. Priority actions for the non-communicable disease crisis. Lancet 2011;1438-47. 40. Gupta A, Gupta R, Sarna M, Rastogi S, Gupta VP, Kothari K. Prevalence of diabetes, impaired fasting glucose and insulin resistance syndrome in an urban Indian population. Diabetes Res Clin Pract 2003;61:69-76. 41. Gupta SP, Malhotra KC. Urban - Rural trends in the epidemiology of coronary heart disease. J Assoc Physicians India 1975;23:885-92. 42. Kearney PM, Whelton M, Reynolds K, Muntner P, Whelton PK, He J. Global burden of hypertension: Analysis of worldwide data. Lancet 2005;365:217-23. 43. Prabhakaran D, Shah P, Chaturvedi V, Ramakrishnan L, Manhapra A, Reddy KS. Cardiovascular risk factor prevalence among men in a large industry of northern India. Natl Med J India 2005;18:59-65. 44. Kutty VR, Balakrishnan KG, Jayasree AK, Thomas J. Prevalence of coronary heart disease in the rural population of Thiruvananthapuram district, Kerala, India. Int J Cardiol 1993;39:59-70. 45. Landsbergis P, Theorell T, Schwartz J, Greiner BA, Krause N. Measurement of psychosocial workplace exposure variables. Occup Med 2000;15:163-88. 46. Fuller CJ, Narasimhan H. Information technology professionals and the new-rich middle class in Chennai (Madras). Mod Asian Stud 2007;41:121-50.